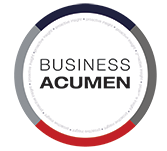 What is Business Acumen Tutorial? Business Acumen is defined as the efficiency how a business person can gain knowledge, understand, analyze, interpret and handle the situation in a professional and profitable manner. Manager who are playing multiple roles often tend to compartmentalize their own thinking. The required job is done by this but it won’t let manager to face an unwanted situation. Business Acumen makes the managers aware of key features that are needed to run an organization successfully and gives them the chance to see things from a broader perspective. We shall discuss the basics of Business Acumen and what it takes to be a successful business-person. This tutorial is targeted for young professionals who are ready to learn the company expectations and how they are supposed to interpret their responsibilities. Calm mindset and be open to exploring the suggestions are expected from the professionals.